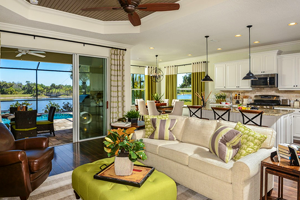 Magnolia Point is one of the best-selling developments of Neal Communities, a prolific builder of Bradenton and Sarasota homes for sale. Opened in April 2015 with just 74 home sites, this community came out with a new phase in May 2017 for an additional 37 residential lots. The warm market reception on Magnolia Point owes much to its central location between Sarasota and Bradenton on the southeast corner of Tuttle Avenue and Whitfield Avenue. The community’s first phase is accessible via Tuttle Avenue while the second phase is located adjacent east along Lockwood Ridge Road. 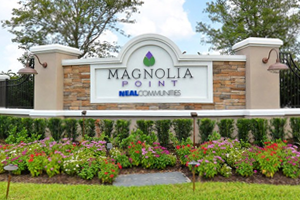 Neal developed Magnolia Point homes for sale within an intimate, gated community. 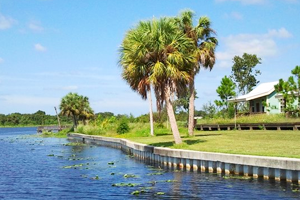 A walking trail connects its two neighborhoods which has abundant open, green space and home sites offering lake and preserve views. As part of the Magnolia Point development, the Lakewood Ranch-based Neal Communities extended Tuttle Avenue from its erstwhile dead-end on 71st Terrace East. This half-mile road extension connected Tuttle to Whitfield Avenue and onwards farther north to State Road 70, a masterful stroke benefitting not only Magnolia Point homes for sale. The extension created a long-planned north–south road connector from 77th Street East (Tallevast Road) in Sarasota to the Bradenton area, thus providing enhanced mobility to local residents as well. Trips, for instance, have been made more convenient to such commercial hubs as the University Walk and the Mall at University Town Center with the completion of this road connector. Neal Communities lists six model choices for its Magnolia Point homes for sale, presenting options on one or two-story dwellings and starting prices generally around the $300s. The larger two-story designs feature floor areas ranging from 2,390 to about 2,500 square feet good for three to four bedrooms. The one-story homes for sale in Magnolia Point are designed with floor areas of between 1,700 and 2,350 square feet, also featuring three up to four bedrooms. One of these single-story designs, the Applause, was showcased in the 2017 Manatee Sarasota Parade of Homes. It was cited for Best Kitchen and Best Architectural Detail, thus stamping the classy builds of Magnolia Point homes for sale. Besides their superior features, Magnolia Point homes for sale offer prospective buyers convenient access to such local attractions as Jiggs Landing on the Braden River only a short drive east of the community. A fishing camp, Jiggs Landing is also a hotspot for paddlers. Rental cabins, canoes and kayaks are available in this county preserve, and more facilities are forthcoming. Manatee County is about ready to spend $1.6 million here for a trail, additional cabins, restrooms, a playground, and picnic facilities. Country club membership is likewise available at Palm Aire also just east of Magnolia Point. Besides its 18-hole private golf course, this country club provides membership privileges to its eight tennis courts and pickleball court. It also features a clubhouse for socials and dining, as well as an Athletic Center with an Olympic-size pool. For young households, living in Magnolia Point bring them close to many local schools. These include Tara Elementary, Kinnan Elementary, Sara Scott Harllee Middle, and Braden River High. Below are the current real estate listings available at Magnolia Point.